In 1928, Amanullah, the king of Afghanistan, visited Poland. When he was travelling through the streets of Warsaw, he thought that the advertisements attached to shop windows were banners prepared especially for the occasion of his arrival and that “E. Wedel” meant “welcome.” When he met with Piłsudski, he enthusiastically announced, “E. Wedel Polska!”. It is hard to establish how true this story really is – its other version mentions the king of Albania, not Afghanistan. It is certain, however, that the confectionery and decorative packaging of the Warsaw-based Wedel company were famous throughout the country. One of such tins is a part of the exhibition The Things of Warsaw. Among numerous E. Wedel packages in the collection of the Museum of Warsaw, this one is truly unique, as it is the only one to have an obvious connection to Warsaw. Most confectionery packaging in the collection of the Museum is decorated with floral patterns or exotic fruit. 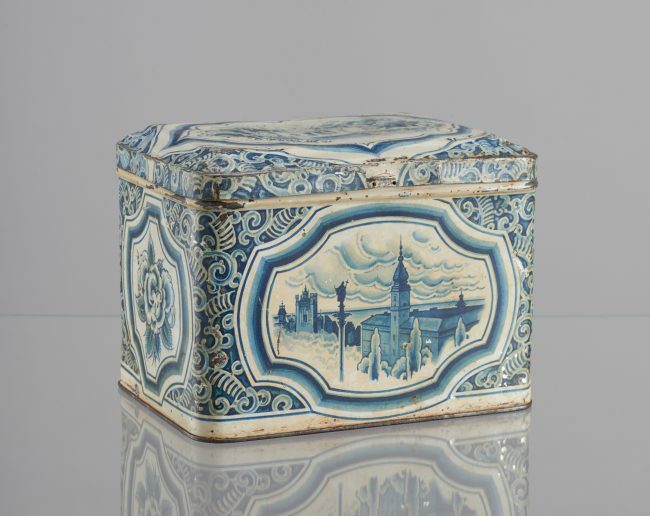 This metal tin, however, depicts typical Warsaw vistas. On the top one can see the Palace on the Water in Łazienki, and on the sides – the Castle Square with Sigismund’s Column, the Royal Castle, and the St. John’s Archcathedral, some of the most popular sites associated with the capital. The name of the designer of the tin is unknown, but it was certainly no ordinary person. Emil Wedel was renowned for the attention he paid to the quality and appearance of the packaging. He commissioned some of the most prominent Polish artists to design them. In the 1920s, Zofia Stryjeńska was one of the company’s contractors. She designed a number of packages, including the red-and-white wrapper of the Jedyna chocolate bar, still in use today.